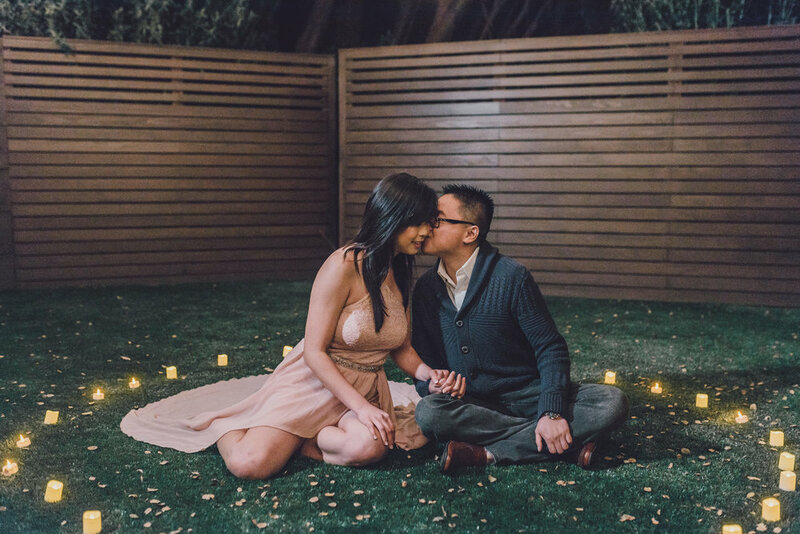 Recently I had the pleasure of photographing Yiling & Kheo’s engagement session alongside my friends Andrew and Terrill. Yiling and Kheo are such a sweet couple and I feel so blessed that I got to capture their special moment in one of the most beautiful places in California: Big Sur. As you can already tell from these photos, they are a natural when it comes to posing. We rarely had to direct them and just kept capturing the emotion that they had for each other. As we were heading back to our car, we saw these light rays peaking through the trees. We stopped dead in our tracks and began shooting this fascinating scene in front of us. After our adventure in the woods, we did a quick photoshoot in the backyard of our Airbnb. Andrew and Terrill were prepared as they brought sparklers and candles. Perfect props to set the intimate mood. We woke up bright and early next morning to get to the coastline of Carmel-By-The-Sea a small town in the Monterey Peninsula. It was still a little dark when we got to our location but after a few minutes we could see the sun start to rise. Although not pictured here, Andrew got the drone up and got some amazing footage of us from up in the sky. Our final location was Point Lobos State Park. I’ve never heard or seen this place so this was quite the unexpected surprise for me. After exploring the park, I can say that this was one of the most beautiful state parks that I’ve ever been to. Yiling and Kheo mentioned to us that this was actually the spot where Kheo proposed to Yiling about a year ago. It was just the two of them that day expressing their love for each other with the sound of the waves in the background. The perfect spot for a proposal if I say so myself. Thank you Andrew and Terrill for inviting me out to shoot this engagement session with you guys. And of course thank you Yiling and Kheo for just being the cutest couple! It was amazing working with you guys and you all me feel welcomed and confident in my ability to capture this special moment.